Applying the principles of psychogeography to the digital landscape, Views from Paradise uses language as a means to subvert our understanding of place (i.e. paradise) and insert poetics into modern methods of navigation (i.e. 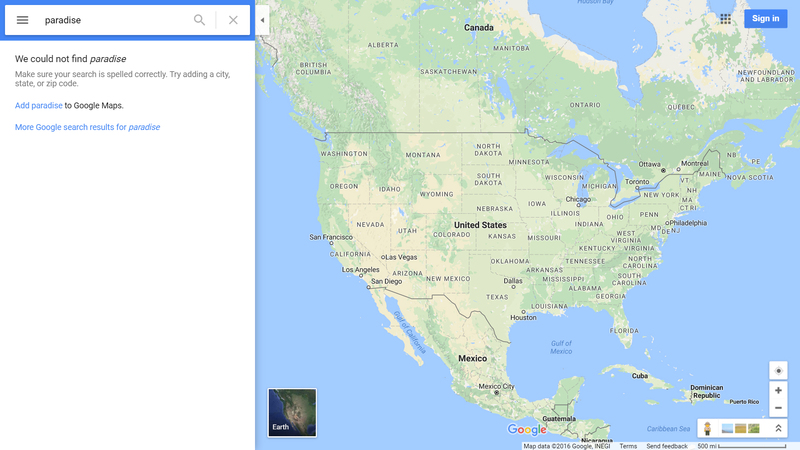 Google Maps). Technological leaps over the past decade have put dislocation at the forefront of daily experience. The Internet has become a place in which we can travel everywhere without going anywhere. With definitions and directions at our fingertips, digital technology is significantly altering the ways in which we primarily experience place and the real world. Google Maps, specifically, has had a major impact on the ways in which we explore new places. Rather than inserting oneself into an existing landscape, as with paper maps, we have become the dot in the middle of a digital map constructed around us. This has a profound impact on the way we conceptualize ourselves in terms of the spaces we inhabit, as well as how we navigate those places. We are constantly locating ourselves, but we don’t really know where we are. “Views from Paradise” builds upon the historical precedent of psychogeography, which is the study of the geographical environment on one’s behaviors and emotions. Guy Debord believed there should be non-linear strategies for exploring cities that would remove pedestrians from day-to-day routines and cause them to consider the urban landscape anew. In “Theory of the Dérive,” (dérive meaning “drift” in French), Debord encouraged pedestrians to navigate urban terrain by impulses resulting from the observation of one’s surroundings. Debord’s investigations took visual form in non-traditional maps that spliced urban centers into disconnected pieces, strung together by meandering, roundabout arrows. Navigation and walking itself became fertile territory for exploration. Artists like Richard Long and Hamish Fulton turned to walking as a means of art-making—although usually in natural, rather than urban, landscapes—in which language and photography serve as documents of these journeys. While “Views from Paradise” is rooted in the physical, it also occupies the space of the digital, as well as the imagined, in order to provide a new awareness of the interplay between these landscapes. Similarly, Janet Cardiff and George Bures Miller’s series of walks exist in the space where the physical, digital and imagined converge in a single setting. In these walks, videos play on handheld devices, parts of which were recorded in the same physical spaces, while the accompanying audio directs the path of the viewer through and beyond the space in which they stand. The depicted space of a train station overlaps with the physical as passersby cross through both places; meanwhile, the audio directs the viewer through the space while talking of memories and other associations. 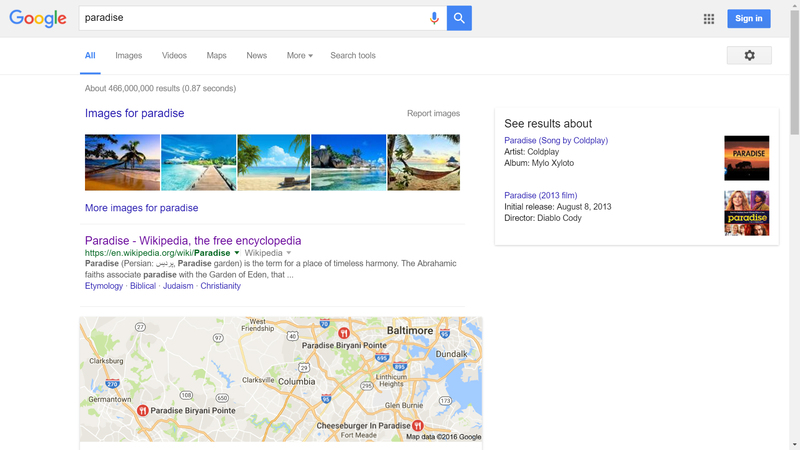 “Views from Paradise” questions the inherent limitation of Google Maps upon one’s impulse to explore. It is a technological device that offers step-by-step directions from one location to another dependent upon a few established variables, such as traffic, time and tolls. When used as a navigational tool, one is less likely to get lost or to encounter the unexpected. While other digital navigation tools exist, such as Yelp, Instagram or any multitude of newly released, lesser known apps, these are all dependent upon the screen and specified results. Most will ultimately end in a list of directions. “Views from Paradise” disrupts the usual way of encountering new places. By using Google Maps as an interface and a means of exploration, itself located within a browser (browsing as a new way of looking), an idea—paradise—is the starting point rather than a destination being the end result. The word paradise represents a place of perfection or escape. The word conjures images of sunsets and beach escapes. An initial Google search of the word yielded a row of these types of images, a song by Coldplay, a 2013 movie, a Wikipedia entry and an image of Google Maps with various pins and business names. 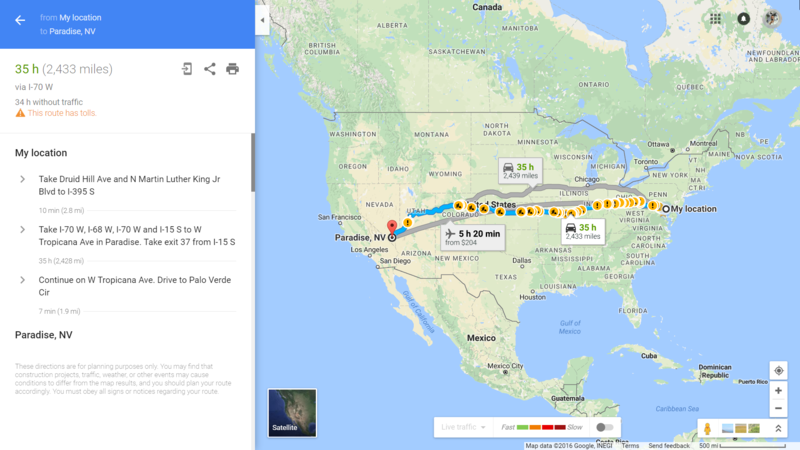 Using Google Maps as a means to locate physical places of business that use the word “paradise” in their name, roots the conceptual in the physical. It conflates a utopian ideal with a physical reality. Maps themselves are abstractions of real space. From a conceptual framework, through a digital interface, we arrive at a physical location. 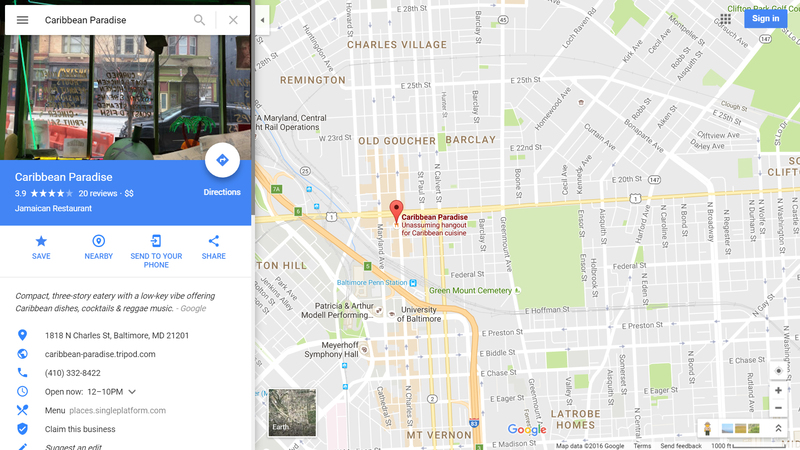 From “My location” in Baltimore, MD—through a window that displays Google Maps on my computer screen—I discover Paradise Nails, Paradise Inn, Caribbean Paradise. 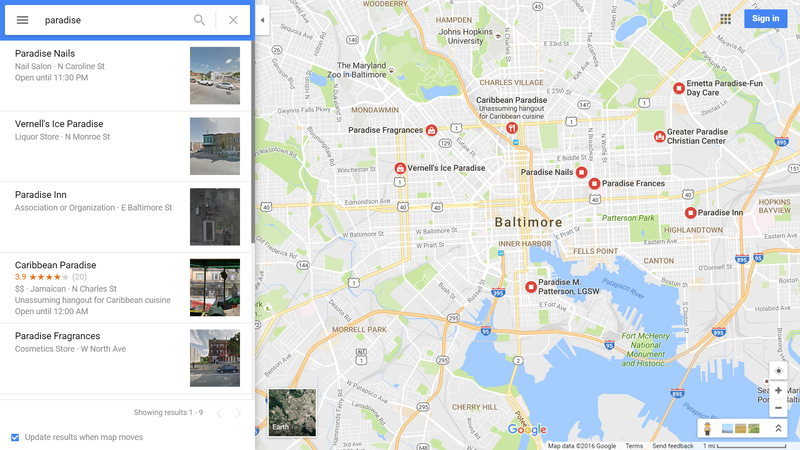 By physically traveling to these locations, I am able to document the view from within these establishments, a view otherwise absent from Google Maps. My camera points through physical window frames to portray actual streets. The implication of redirecting the gaze, looking out rather than looking in, is to regain awareness of possibility—the realm beyond that which is documented by Google Maps. 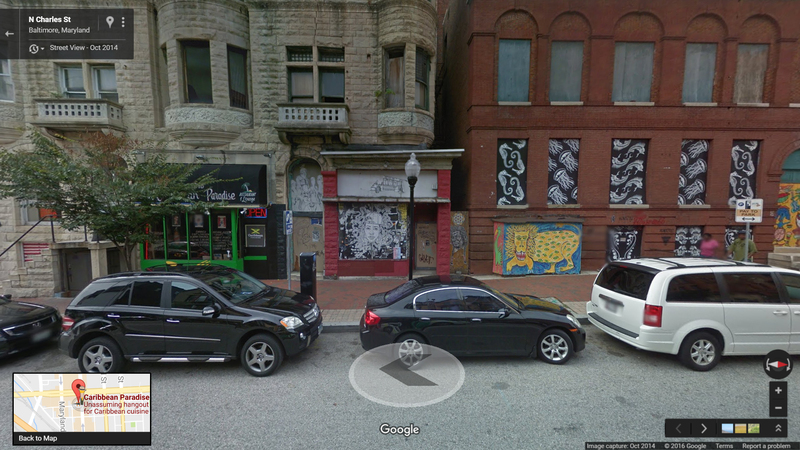 I return these images to the space of the browser by uploading them to Google Maps where they are publicly available. There, anyone with an internet connection searching for paradise may come across one of these images, where it will join a growing archive of this alternate perspective as I travel home to my native Nebraska and up and down the East Coast to search for paradise in New York, DC and Philadelphia. The search itself becomes an unseen performance. It is a quiet, poetic, subversive means to critique contemporary methods of navigation. It is a new way to navigate digital space and to inspire exploration beyond the linear. 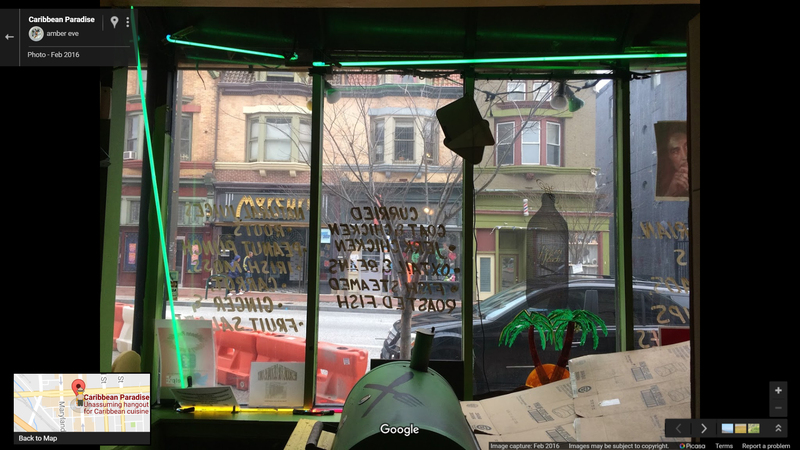 By uploading images captured from the physical locations of these establishments to Google Maps, the project becomes a conflation of the real, the digital and the imagined. Using Google Maps as an interface and the word “paradise” as a means of navigation, it upsets the usual expectations of encounter and exploration. Furthermore, it builds an alternate archive of the idea of paradise as it is now understood. This challenges the relationship between a word, a location and an idea, as well as one’s relationship to those things and the way one navigates those spaces. “Views from Paradise” creates new knowledge for navigating space in the digital era and exposes the divide between actual experience and virtual experience. It is in line with contemporary work like David Horvitz’s “241543903,” in which he uploaded an image of a person with their head in a freezer tagged with said number alongside instructions to do the same. Now, when 241543903 is googled, countless images of people with their heads in freezers result. Similarly, Miranda July’s “Somebody” app connects people with strangers who deliver face-to-face messages via app users physically close to them in proximity. These two works specifically set a precedent for upsetting the usual means of interaction with the digital world. Like “Views from Paradise,” these projects question the role of the internet in everyday life. In my multidisciplinary practice, I combine objects, images and environments with poetic dialogues to expose the divide between the digital and the real. Deliberate and contemplative, it illustrates the placelessness of uprooted existence—of being in between, not there, nowhere—as I search for stability and tangible points of reference. My work is an exercise in orientation as I attempt to order my displacement. Cardiff, Janet and George Bures-Miller. “Walks.” Janet Cardiff George Bures Miller, http://www.cardiffmiller.com/artworks/walks/index.html. Accessed November 11, 2016. Debord, Guy. “Introduction to a Critique of Urban Geography.” The Library at nothingness.org, http://library.nothingness.org/articles/SI/en/display/2. Accessed August 26, 2016. Jeffries, Adrianne. “People on the Internet Put Their Heads in the Freezer.” Observer, 26 Jan. 2011, http://observer.com/2011/01/people-on-the-internet-put-their-heads-in-the-freezer/. Accessed August 26, 2016. July, Miranda. “Somebody.” Miranda July, 28 Aug. 2014, http://www.mirandajuly.com/#somebody-2. Accessed August 26, 2016.